Now that the Canucks have reached the official halfway point of the 2010/2011 season, we take a look back and give the players their midseason marks. Roberto Luongo: Quietly, Roberto Luongo put together a very good first half to this season. Despite the endless criticism – and perhaps pushed by Cory Schneider’s play – Luongo finished the first half 4th in the NHL in wins (19), 10th in save percentage (0.921) and 11th in GAA (2.33). 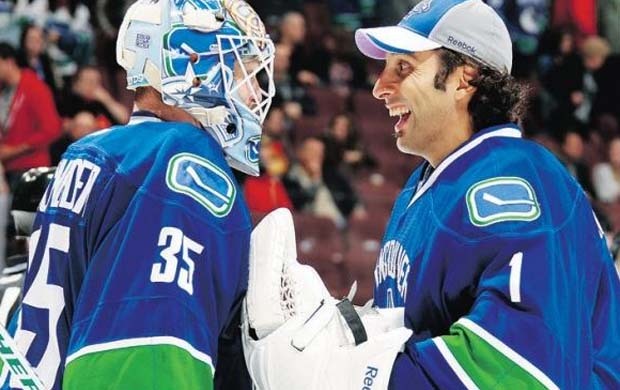 Luongo rarely needs to steal games anymore; he just needs to play well enough to not lose them. Cory Schneider: Give credit to the Canucks – they had a plan for Cory Schneider’s development and they’ve stuck with it. After sheltering him a bit in his first few starts, the Canucks have trusted him with starts in Dallas and San Jose in the last week and a half. Schneider had 12 appearances in the team’s first 41 games; he started 10 of those games and has recorded at least a point in each (8-0-2). Not to quibble, JJ, but what, exactly, would Schneider have had to do to get an A? Get points in 11 of the 10 games he started? You know what’s funny? Schneider’s mark was the one I struggled with the most. There’s no doubt he’s been good and you can’t argue with his 8-0-2 in starts. I just kept thinking back to some of his recent games (with the exception of the ‘Canes and Sharks games) when I felt the Canucks won, not because of his goaltending, but more so because they simply outscored the other team.